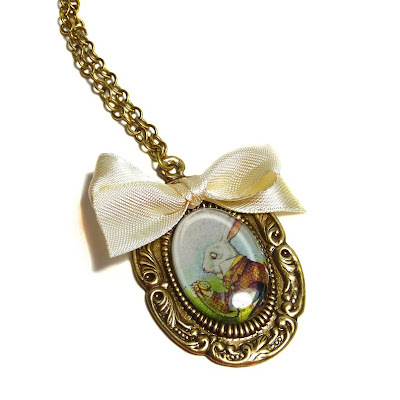 That's right you can win this Gorgeous White Rabbit necklace hand made by myself! All you have to do is tell me what the Rabbit carries with him to tell the time! Send me a comment with your name and Answer or email me at cherished_trinkets@yahoo.co.uk to be entered and I will draw a winner next Monday the 23rd of November at 6pm. EDIT: I have had to change the time of this draw to the slightly earlier time of 5pm. Anybody can enter, one entry per person! 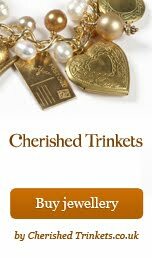 What a lovely blog you have and am full of admiration for your fab creations- have my eye on many of them! Hope you don't mind but have been inspired to post about your giveaway and your site. Thank you :o) That's so kind. I've entered you in the draw, so good luck! I'm coming over for a nosy now! The rabbit carries a pocket watch. for those who wander off into curiosity would know that the white rabbit carries a pocket watch but is never on time. my all time favourite book.